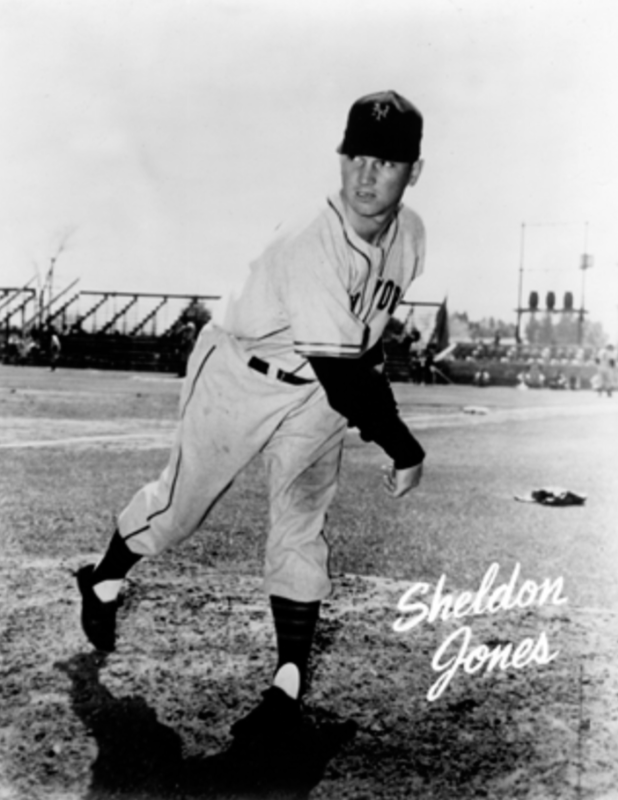 From 1946 through 1951, Sheldon Jones pitched in 199 games for the New York Giants. He started 98 times during that span and made 101 appearances in relief. His willingness to accept any mound assignment earned him the nickname “Available.” The moniker was derived from Al Capp’s Available Jones, who first appeared in the Li’l Abner comic strip in 1941. “If it is too unpleasant for you to do, I’m available” was the character’s catchphrase. Sheldon Leslie Jones was born in Tecumseh, Nebraska, on February 2, 1922. He was the fourth of six boys born to John and Mabel Jones. Sheldon spent most of his youth living on a farm near Lincoln. By 1940 the Jones family had relocated to York, Nebraska, where Sheldon’s father worked as a carpenter at a lumberyard. Jones graduated from York High in 1940. The school didn’t have a baseball program so he got his start on the diamond with the local American Legion team. In 1939 he joined the Fairbury club of the Ban Johnson Amateur League. The following year, the hard-throwing right-hander led the circuit in strikeouts (218) as Fairbury won the Ban Johnson League national championship. Cleveland Indians scout Jim Payton liked what he saw in Jones and signed him to a contract in 1941. The 6-foot, 180-pound rookie split time between Oklahoma City (Texas League) and Salina (Western Association) during his first year of pro ball, finishing the season with a 2-15 record. Oklahoma City, now operating under a working agreement with the New York Giants, traded Jones to Jersey City for outfielder Herschel Martin and cash. Jones appeared in two games for Jersey City in 1942, giving up eight runs, six of them unearned, and he was shipped back to Oklahoma City. The Texas League team optioned him to the Fort Smith Giants of the Western Association, where he spent most of the season, posting a 9-7 record. Jones joined the Army Air Force in October 1942 and was sent for technical training to Miami Beach, Florida. The following spring he pitched for the Non-Commissioned Officers team in the Army Air Force BTC-4 League, then switched to the Merrill-Stevens Dry Dock club in the Dade County Victory League. Jones went undefeated during the regular season, tossing two no-hitters, including a perfect game, while leading Merrill-Stevens to the league championship. After graduating from technical training school with the rank of sergeant, Jones was sent to Panama, where he pitched for the Diablo Heights Devils in the Panama Canal Zone League. Jones was discharged in February 1945 and returned to Los Angeles, where he lived with his wife, Lillian. Jones made his major-league debut in a start against the Philadelphia Phillies at Shibe Park on September 9, 1946. He struck out six hitters in six innings while allowing five hits, five walks, and four earned runs in a game that Philadelphia won in the bottom of the ninth. On the last day of the season, Jones notched his first major-league win, against the Phillies at the Polo Grounds. He struck out eight while scattering seven hits as the Giants won, 3-1. During spring training with the Giants in 1947, Jones’s wildness led to his being farmed out to Jersey City. Working out of the Jersey City bullpen, he soon regained his control, eventually earning a spot in the starting rotation. By the end of July he had 13 victories, including six in a row. Mel Ott, still in need of pitching, went to Hubbell and once again he recommended the talented youngster. In his first major-league game of 1947, against the Pittsburgh Pirates on August 3, Jones walked three batters but tossed four innings of no-hit ball. He issued another free pass in the fifth, then was removed in the sixth inning after giving up a home run to Ralph Kiner. Over the next few weeks, Jones continued to be plagued by wildness and an inability to get past four innings without losing command of his pitches. In a September 8 start against Pittsburgh, Jones once again found himself having a hard time getting the ball over the plate, and was removed in the third inning after walking three batters, hitting two, and nearly beaning another. But after that game, Jones seemed to find his rhythm in the bullpen and pitched much better over the last few weeks of the campaign. At the outset of training camp in 1948, Ott made it known that he was looking for a number-two starter to back up ace Larry Jansen. In the Giants’ first exhibition game, against Cleveland, Ott brought Jones in from the bullpen with the bases loaded and two men out in the bottom of the ninth inning. The Giants were clinging to a 4-3 lead with home-run threat Pat Seerey coming to the plate. Jones fanned Seerey on three straight curveballs. Available, as he was now being called, went on to have a great spring training for the Giants. He pitched the team’s first complete game, while allowing only two runs in 40 innings. One of his victories was a shutout of the Indians against Bob Feller at Evansville, Indiana. Available went on to become one of the Giants’ more reliable pitchers in 1948. He appeared in 33 of their first 67 games. From May 17 through July 5, the Giants never went more than two games in a row without pitching Jones. Leo Durocher took over as the Giants manager in July and continued to employ Jones as both a starter and reliever. Despite late-season arm problems, Jones put up his best career numbers in 1948, going 16-8 with eight complete games, four saves and a 3.35 earned-run average. He pitched in 55 games, the fourth most in the league. Although much improved, he still had control issues, leading the National League in wild pitches (10) and hit batsmen (6). In 1949 Jones worked in 42 games, finishing the season with a 15-13 record and a 3.34 ERA. The Giants were leading the league on June 5 but faltered the rest of the way, ending up in fifth place. When spring training opened in 1950, Leo Durocher told the New York Times that Jones would be used as a starter. By early June Jones had been knocked out of the box in four of his first five starts. It was then that Durocher decided to go with a nine-man bullpen. This meant that his former starters had to relieve if necessary. He would also have a quick hook if any of his pitchers got into trouble. In five games from June 1 to 5, the Giants box scores listed 26 pitchers. On September 12, 1950, Jones twirled a six-hit shutout against the Pittsburgh Pirates. The next morning, Jones, who was divorced from his first wife, married Yvette Gowdy Schoen, at the Queens County Courthouse. He went on to pitch in 40 games for the Giants in 1950, posting a record of 13-16 with two saves and a 4.61 earned-run average. Jones threw a one-hitter against the Cubs on July 23 and, at one point during the season, tossed 14 consecutive scoreless innings. The Giants pitcher and his bride took up residence in Williamstown, Massachusetts, where they operated a gift shop from their home. In his spare time, Jones enjoyed hunting and fishing. During the winter, he co-hosted the hot stove league show on a local radio station. He kept in shape during the offseason by working out at Williams College with the school’s baseball coach, former major-league pitcher Bobby Coombs. Jones was also a popular speaker at civic clubs and sports banquets in the Williamstown area. In March 1951 Durocher named Larry Jansen, Sal Maglie, Jim Hearn, and Jones as his starting pitchers. When the season opened, the team struggled and at one point lost 11 games in a row. On April 30 the Giants snapped the losing streak as Jones relieved Sal Maglie and recorded the save. The following day, he earned another save in relief of Jim Hearn. On June 21, in his third start of the season, Jones lost a 2-0 decision to the Cardinals. Three days later, he earned his first win of the season, in relief against the Cubs. On June 28 he tossed three scoreless innings against the Dodgers to notch his second victory. Jones fanned Gil Hodges on three straight called strikes to close out the game. As the 1951 season wore on, Jones struggled to the point where Durocher stopped using him in crucial situations. Over the previous three seasons, the dependable right-hander had compiled 44 victories and averaged over 200 innings pitched. By the end of July, he had logged a little over 70 innings with an uninspiring 2-7 record. On August 12 the Giants were 13 games behind the first-place Dodgers. On the 22nd Jones earned his third victory of the season in a come-from-behind win over the Reds for the Giants’ 11th consecutive victory. Two days later, he defeated the St. Louis Cardinals. On August 28, with the Giants after their 17th win in a row, Jones started against the Pirates. Jones allowed just three hits, but errors by Eddie Stanky and Don Mueller in the eighth inning led to a pair of unearned Pirates runs in the 2-0 loss. Jones netted two more wins in September, with the second victory cutting the Dodgers’ lead to five games. The Giants won 12 out of their last 14 contests, ending the season tied for first place with Brooklyn. In the first game of a best-of-three playoff to break the tie, Jim Hearn tossed a five-hitter as New York won, 3-1. With the Giants one victory away from reaching the World Series, Durocher surprisingly selected Jones, with a 6-10 record, to start the second game. Most Giants fans felt that Sal Maglie would have been a better choice but Durocher had a plan. Knowing that Maglie had a sore shoulder, the Giants manager didn’t want to risk using his ace without giving him his normal three days’ rest between starts. Jones’s opponent in Game Two was Dodgers rookie Clem Labine. Jones had lost three out of his last four starts against Brooklyn and hadn’t pitched in seven days. Jones allowed two runs in the first inning and was removed with one out in the third inning. Brooklyn scored eight more runs on the Giants bullpen over the course of the game while Labine hurled a six-hit shutout. Although it was not one of his better performances, Jones’s willingness to start on short notice gave Maglie an extra day to rest his ailing shoulder. Maglie started Game Three and kept his team close, allowing four runs on eight hits, setting the stage for Bobby Thomson’s heroics in the ninth inning. The victorious Giants would now square off against their intercity rivals, the Yankees, in the World Series. The Giants and Yankees split the first two games at Yankee Stadium. In Game Three, at the Polo Grounds, Giants starter Jim Hearn pitched seven scoreless innings before running into trouble with two outs in the top of the eighth. After Hearn walked in a run, making it 6-1 Giants, Durocher summoned Jones in from the bullpen to face Hank Bauer. Jones induced Bauer to hit a comebacker to the mound for the final out. In Game Four the Yankees got to Maglie for four runs in the first five innings. In the top of the sixth, Jones came in and gave up two runs before removed for a pinch-hitter in a game that the Giants eventually lost 6-2. The Yanks went on to capture the next two contests, winning the Series in six games. In the offseason the Giants added former Cardinal Max Lanier to their pitching staff. Jones’s name had been mentioned in trade talks over the prior two years and the acquisition of Lanier made him expendable. On April 8, 1952, Jones was dealt to the Boston Braves for hard-hitting third baseman-outfielder Bob Elliott and an amount reported at the time as $35,000, but which may have been substantially larger.9 Elliott was acquired to replace the injured Monte Irvin as the cleanup hitter. On August 15 Jones extracted some revenge against his former teammates. He relieved Ernie Johnson with nobody out and a man on third in the bottom of the ninth of a 4-3 game. Jones retired Dusty Rhodes, Bobby Thomson, and George Wilson in order to earn his only save of the year. Jones appeared in 39 games for the Braves in 1952, posting a 1-4 record. On December 20, 1952, Jones was traded to the Chicago Cubs for cash and pitcher Monk Dubiel. The Cubs acquired Jones to take some of the workload off veteran reliever Dutch Leonard. Jones pitched in 22 games (0-2) with Chicago before being sent down to Springfield in the International League. The following year, he was sold to the Los Angeles Angels in the Pacific Coast League. After he started out 3-6, the Angels optioned him to Beaumont of the Texas League. In October, Jones’s contract was sold to Macon and he hung up his spikes a short time later. After retiring from baseball, Jones worked for the General Electric Company in Dallas, Texas. His marriage to Yvette ended in a divorce in 1970 and five years later he married the former Patricia Perry. Jones eventually relocated to Greenville, North Carolina, where he died of lung cancer on April 18, 1991, at the age of 69. He was survived by his wife, Patricia, and three children, Shelley, Susan, and David. He was buried at Greenwood Cemetery in Greenville. In 2013 Sheldon Jones was inducted into the Museum of Nebraska Major League Baseball’s Hall of Fame. This biography is included in "The Team That Time Won't Forget: The 1951 New York Giants" (SABR, 2015), edited by Bill Nowlin and C. Paul Rogers III. 1. Ken Smith, “Jones Pops Pp as Prize Product in Ott’s Hopper of Hill Hopefuls,” The Sporting News, April 21, 1948, 15. 2. Bobby Norris, “Sheldon Jones Tagged for Giants Comeback Grooved In Army,” The Sporting News, September 11, 1946, 12. 4. Frank C. True, “Giant Trainer, Coach Helped Jones,” New York Sun via The Sporting News, May 5, 1948, 14. 6. James Szalontai, Close Shave: The Life and Times of Baseball’s Sal Maglie ( Jefferson, North Carolina: McFarland & Company, Inc., 2002), 90. 7. “Stoneham Denies Report of Jones-for-Barney Swap,” The Sporting News, June 14, 1950, 6. 8. “Polo Ground Breezes,” The Sporting News, October 17, 1951, 10. 9. Arch Murray, “Giants Bag Elliott and Hunt More Help for Sagging Attack,” The Sporting News, April 16, 1952, 13.